Do you agonize over the state of the world and worry about the future of the planet? Are you looking for alternatives to capitalism? Are critical thinking and learning about the first attempts to build socialist societies important to you? Have you wanted to hear fact-based and substantive responses to the charges routinely leveled against communism? If you answered “yes” to any of these questions, you have come to the right place. This website will give you the tools to challenge the paralyzing conventional wisdom about communism that has seeped so deeply into popular understanding. •How the current intellectual and academic atmosphere constrains and mutilates the discourse of what is possible in the world. •What socialism and communism actually are—and are not. •How the conventional wisdom, as well as the “state-of-the-art” scholarship, about the experience of socialist revolutions of the 20th century is shot through with distortions and lies…and how this robs people of understanding. •A look at the most important revolutionary experience thus far, the Cultural Revolution of China: its purposes, its achievements, and its shortcomings. 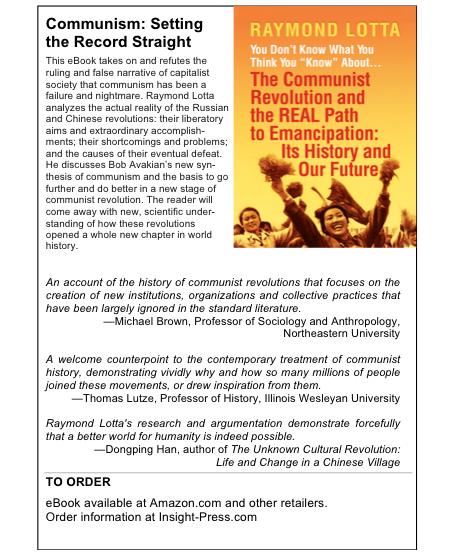 •How Bob Avakian’s new synthesis enables humanity to go further and do better in making socialist revolution in today's world. From a thousand different directions, we are bombarded with the message that communism was a “nightmare” and “failure.” Go into a bookstore and look at the current titles on Mao, the Cultural Revolution, or socialism in the Soviet Union. Take a listen when commentators on TV and radio say something about communism. Leaf through a standard textbook on political theory or modern history. There’s a highly distorted narrative of socialism in the 20th century, and it goes largely unanswered. The truth is that the first socialist revolutions—in the Soviet Union from 1917 until the defeat of that revolution in 1956, and in China from 1949 until the defeat of socialism in 1976—marked a break-through for humanity. These were the first attempts in modern history to build societies free from exploitation and oppression. And they accomplished extraordinary things against enormous obstacles. The mission of Set the Record Straight is to factually refute the lies spread in the media, mass-market books, and mainstream scholarship about the Soviet and Chinese revolutions, and to bring to light the overwhelming achievements of these revolutions as well as their real problems and shortcomings. Our mission is to reveal the actual history and experience of these revolutions, to open up a two-sided debate about socialism and communism, and to promote a conversation about why a radically different and liberating world is possible. In all of this, we are bringing forward Bob Avakian’s exciting vision of a vibrant communism for the 21st century. At a time of continuing imperial wars, massive global hunger, planetary environmental emergency—and at a time of new stirrings of resistance and questioning—the intellectual landscape needs to change. A new generation of students and scholars needs to engage the question of communism’s past and communism’s future in a whole new way. Set the Record Straight seeks to challenge the paralyzing conventional wisdom about communism that has seeped so deeply into popular understanding and to raise people’s sights to a far better future for humanity. •Get answers to the most basic questions about communism: Frequently Asked Questions—What Is Communism, What Is Its Real History, What Does It Have to Do with the World Today? •See how Bob Avakian’s new synthesis of communism is being applied towards more deeply understanding and evaluating the rich and complex experience of the first wave of socialist revolutions. 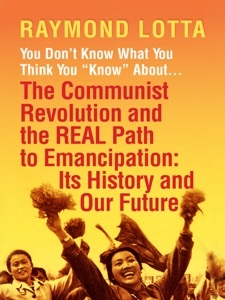 •Explore the real history of the revolution in Russia from 1917 to 1956 and in China from 1949 to 1976, especially the Chinese Cultural Revolution from 1966 to 1976—the monumental achievements of these socialist societies as well as their shortcomings. Print Fact Sheets on revolutionary China’s social and economic achievements and the truth about the Cultural Revolution in China. •Watch video and listen to audio of talks and interviews with people who participated in the Cultural Revolution in China from 1966-1976—and who uphold the great achievements of the revolutionary upheaval of that decade! •Find out about the debate and controversy about Stalin, what really happened in the 1932-1933 famine in the Soviet Union, and the truth about the Great Leap Forward in China, 1958-1960. Question: What exactly are you referring to when you say the “first stage” of communist revolution? Raymond Lotta: We’re talking about a sea change in human history, the first attempts in modern history to build societies free from exploitation and oppression. Specifically, we’re talking about the short-lived Paris Commune of 1871, the Russian revolution of 1917-1956, and the Chinese revolution of 1949-1976. These were titanic risings of the modern-day “slaves” of society against their “masters.” They aimed to bring about a community of humanity, a society based on the principle of “from each according to their ability, to each according to their needs,” and one where there are no more divisions among people in which some rule over and oppress others, robbing them not only of the means to a decent life but also of knowledge and a means for really understanding, and acting to change, the world. This interview appeared in the November 24, 2013 special issue of Revolution newspaper. The full article is at revcom.us. Red Guards visit a factory in China, January, 1967.